Our 2015 event was covered in a number of local publications. Here’s a selection of the 2015 Taste the World Press. Thank you for the features! Cinnamon Russell and Dianne Carruthers Wood chaired a benefit for Cambodia’s Angkor Hospital for Children and clinics in Myanmar. TIMELY TREATMENT: There can’t be much wine served at Cambodia’s Angkor Hospital For Children. But 250 vintages poured in the Four Seasons hotel ballroom recently will help give more than 20,000 youngsters what they do need from that facility: critical treatment. 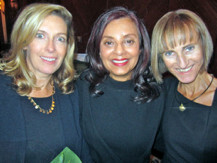 Chaired again by investment biz pro Cinnamon Russell and filmmakerDianne Carruthers Wood, the sixth annual Taste The World gala aimed to raise $170,000, including still-counting donations. It also supported Medical Action Myanmar clinics. The fundraiser sprang from attendees John and Nina Cassils and others having provided $2.5 million in capital and operating funds to the hospital. Among those serving jolly juice, Vino Allegro Wine Imports managing director Vicky Ainley had visited the facilities and, as a former photographer, doubtless brought back more than memories. INSPIRED HEALTH: Hundreds came together for the annual Taste the World fundraiser, a signature event for Angkor Children’s Hospital. Party founders John and Nina Cassils welcomed a capacity crowd to the sixth running of the food and wine grazer held in collaboration with the Import Vintners and Spirits Association. Chaired by Cinnamon Russell and Dianne Carruthers-Wood, the charity event, which raised a reported $125,000, will provide health care to millions of disadvantaged kids and their families in Cambodia and Myanmar. An appreciative Helen Catton, clinical director of the hospital, thanked the room of oenophiles, tastemakers and philanthropists for their generous support, sharing more than 20,000 kids will benefit from the six-figure haul. From left, gala co-chair Dianne Carruthers-Wood, event founder Nina Cassils and clinical director Helen Catton saw $125,000 raised at the sixth Taste the World fundraiser, benefitting Angkor Children’s Hospital.